Introducing Grub GONE!® an all natural biological control product that specially targets and effectively eliminates destructive white grub larvae. The first of its kind, Bacillus thuringiensis galleriae (Btg) is a bio-insecticide that controls white grub larvae with the equivalent efficacy results achieved by synthetic grub control products. 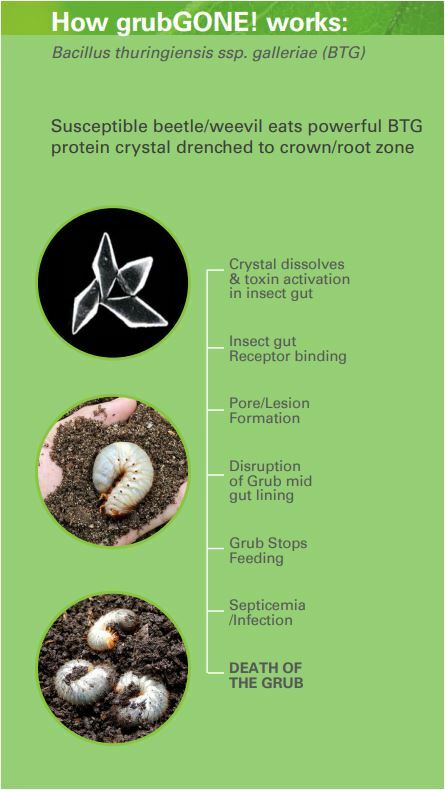 Grub GONE!® works not only as a preventative treatment measure, protecting the lawn from grub infestations, but as a curative application by eliminating existing grub populations. Grub GONE!® is safe for people, pets, children, and off-target beneficial insects such as pollinators, birds and aquatics without any side effects or damage. Grub GONE! is a newly registered, biological grub control product that is approved for use by the Pest Management Regulatory Agency. Mode of action for grub GONE! 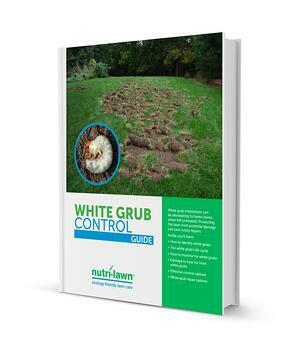 White grub infestations can be devastating to home lawns when left untreated. Protecting the lawn from potential damage can save costly repairs.